The Vedic Sanskrit term Ātman (Pāli, attā), literally meaning breath or spirit, is often translated into English as self, soul, or ego. 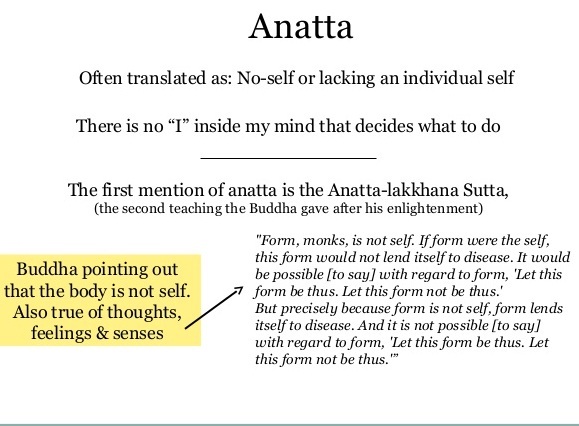 Etymologically, Anātman (Pāli, anattā) consists of the negative prefix an- plus Ātman (i.e., without Ātman) and is translated as no-self, no-soul, or no-ego. who suggested that there does exist in one’s personality, a permanent, un-changing, immutable, omnipotent, and intelligent Ātman, which is free from sorrow and leaves the body at death. Some Upaniṣads hold that the Ātman can be separated from the body like the sword from its scabbard and can travel at will away from the body, especially in sleep. But Buddhism maintains that since everything is conditioned, and thus subject to Anitya (Impermanence), the question of Ātman as a self-subsisting entity does not arise. The religion points out that anything that is impermanent is inevitably Duḥkha (Suffering) and out of our control (Anātman), and thus cannot constitute an ultimate self. According to Buddhism, beings and inanimate objects of the world are constructed (saṁskṛta), as distinguished from Nirvāṇa, which is unconstituted (asaṁskṛta). The last 4 of these skandhas are also collectively known as nāma (name), which denotes the non-material or mental constituents of a being. Rūpa represents materiality alone, and inanimate objects therefore are included in the term rūpa. A living being composed of 5 skandhas is in a continuous state of flux, each preceding group of skandhas giving rise to a subsequent group of skandhas. This process is going on momentarily and unceasingly in the present existence as it will go on also in the future until the eradication of avidya (ignorance) and the attainment of Nirvāṇa. Thus, Buddhist analysis of the nature of the person centres on the realization that what appears to be an individual is, in fact, an ever-changing combination of the 5 skandhas. These aggregates combine in various configurations to form what is experienced as a person, just as a chariot is built of various parts. But just as the chariot as an entity disappears when its constituent elements are pulled apart, so does the person disappear with the dissolution of the skandhas. there is no human being, there is only becoming. This interaction is one of consciousness (vijñāna) established through cognitive faculties (indriya) and their objects. These faculties and their objects, called spheres (āyatana), include both sense and sense-object, the meeting of which two is necessary for consciousness. —are classified under the name dhātu (element). The universe is made up of a bundle of elements or forces (saṁskāras) and is in a continuous flux or flow (santāna). Every dharma, though appearing only for a single instant (kṣaņa), is a “dependently originating element,” that is, it depends for its origin on what had gone before it. Thus, existence becomes “dependent existence,” where there is no destruction of one thing and no creation of another. Falling within this scheme, the individual is entirely phenomenal, governed by the laws of causality and lacking any extra-phenomenal self within him or her. At the level of “conventional truth” (saṁvṛti- satya), Buddhism accepts that in the daily transactional world, humans can be named and recognized as more or less stable persons. However, at the level of the “ultimate truth” (paramārtha-satya), this unity and stability of personhood is only a sense-based construction of our productive imagination. What the Buddha encouraged is not the annihilation of the feeling of self, but the elimination of the belief in a permanent and eternal constructed thing. Thus, the human being in Buddhism is a concrete, living, striving creature, and his or her personality is something that changes, evolves, and grows. It is the concrete human, not the transcendental self, that ultimately achieves perfection by constant effort and creative will. As the process of one life span is possible without a permanent entity passing from one thought-moment to another, so too is a series of life-processes possible without anything transmigrating from one existence to another. An individual during the course of his or her existence is always accumulating fresh Karma (Action) affecting every moment of the individual’s life. The corporeal bond, which held the individual together, falls away and his or her new body, determined by karma, becomes one fitted to that new sphere in which the individual is reborn. The last thought-moment of this life perishes, conditioning another thought-moment in a subsequent life. The new being is neither absolutely the same, since it has changed, nor totally different, being the same stream (santāna) of karmic energy. There is merely a continuity of a particular life- flux; just that and nothing more. The first flame is not identical to the last flame, but they are clearly related. The flame of life is continuous, although there is an apparent break at so-called death. its antecedents are the saṁskāras, the prenatal forces. There is a “descent” of the consciousness into the womb of the mother preparatory to rebirth, but this descent is only an expression to denote the simultaneity of death and rebirth. but they will never totally disappear till the causes and conditions that hold them together and impel them to rebirth, the craving (tṛṣṇā; Pāli, taṇhā), strong attachment (upādāna) and the desire for re-existence (bhava), are finally extinguished.